Apples of Gold Jewelry offers an elegant and stylish earring that is wonderfully crafted from .925 sterling silver with these dangling floral earrings! 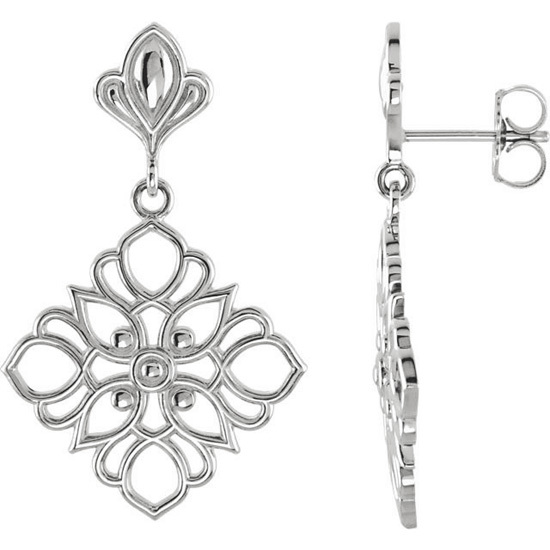 The friction push back closure design keeps these dangling earrings in place, allowing a intricately designed flower to dangle from the stud attached to the post. The earrings measure 1 1/4 inches tall and 3/4 of an inch wide, and are adorned with small silver balls at the center of each flower as well as four surrounding the center. The petals of the earring are created in an open design, making these earrings perfect for day or night! We guarantee our Dangling Floral Earrings in Sterling Silver to be high quality, authentic jewelry, as described above.